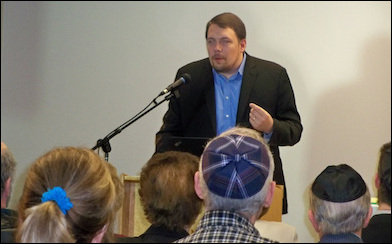 The "man on the Clapham omnibus" visited Beth Tikvah Synagogue last week and quickly approved a tactical suggestion from guest speaker Gregg Roman that the West must pick a side in various Mideastern conflicts and lend it full support. Geoffrey Clarfield, who took on the role of the fictional "average man" on the Clapham omnibus, pointed out there were potential allies throughout the turbulent Arab world. In Egypt, supporting Abdel Fattah el-Sisi, the country's president, against the Muslim Brotherhood's Mohamed Morsi, was a "no-brainer," he said. Clarfield, executive director of Mozuud, an organization whose agenda includes freedom of speech and sanctions on Iran, was part of a panel of three who responded to the presentation by Roman, who serves as director and chief operations officer of the Middle East Forum. Roman surveyed events across the region and presented a "Forecast for Freedom in the Middle East," which was far from rosy. Earlier that day, terrorists had struck an Egged bus in Jerusalem, injuring 21. It was, he said, an event that should be considered part of the third intifadah, which began some months ago with knife attacks on Israeli civilians. "We have now entered to a new stage of the conflict," moving from lone wolf attacks to more co-ordinated ones, as demonstrated in the bus bombing, he said. The next Hamas attack is a matter of "when" not "if." Roman also referred to the news that Israeli security forces had uncovered a terror tunnel that ran from Khan Yunis in Gaza into Israel. The question is not "if" there will be another Hamas-initiated attack, but when, he said. Broadening the scope of his discussion, Roman, who served as political adviser to Israel's deputy foreign minister, examined conflicts throughout the region and noted that major wars in the past – whether the U.S. Civil War or World War II – ended only when one side utterly defeated the other. The war in Syria will continue until one side is defeated, he suggested. At present, "Syria is a mess," he said. Looking at the wider Middle East, Roman said, "ISIS is ideologically stronger than ever" though its military is on the run, Russia is backing the Assad regime in Syria, Iran is acting as a regional hegemon, and the Obama administration is afraid of picking a side or of committing troops to the region to defeat ISIS. "U.S. credibility is a penny stock right now," Middle East Forum director Gregg Roman told the audience in Toronto. The United States, Roman said, sided with the Muslim Brotherhood-linked Morsi against its traditional ally in Egypt, and it has ignored Arab and Israeli concerns over a nuclear deal with Iran. "U.S. credibility is a penny stock right now," he said. At the same time, ISIS has staged attacks in the heart of Europe, prompting a nationalist backlash that is now playing out. Until western nations are willing to force the absorption of new immigrants, there will be further problems, Roman predicted. Despite a rather pessimistic appraisal of the region, Roman said not all hope is lost. Western states can adopt a strategy to make things better, starting with support for minority populations facing oppression and genocide at the hands of ISIS, such as the Yazidis, Turkmen and Kurds, and help them carve out semi-autonomous governments in the region. The West should use "proxies" such as local paramilitary groups in the fight against ISIS, even though these groups might not share western values, he said. The West should adopt realistic objectives and use force to attain them. He suggested adapting the "Earl Butz rule," named after a former U.S. cabinet minister, to stress that if you don't have military power at play, you have no place at the negotiation table. Roman's address was sponsored by the Speakers Action Group. Joining Clarfield on the panel were Rabbi Jarrod Grover of Beth Tikvah, and Iranian-Canadian columnist Sara Akrami. Miles Smit served as the event moderator.